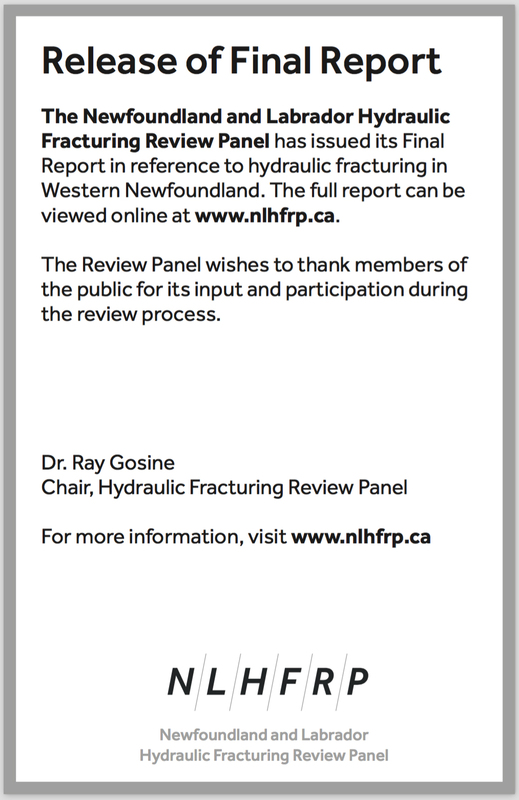 An independent Panel was appointed by the Minister of Natural Resources, Government of Newfoundland and Labrador, in October 2014 to conduct a public review of the socio-economic and environmental implications of hydraulic fracturing in Western Newfoundland. The mandate of the Panel was also to make recommendations on whether or not hydraulic fracturing should be undertaken in Western Newfoundland. The Terms of Reference for the Panel were issued by the Minister of Natural Resources, in consultation with the Department of Environment and Conservation and the Canada-Newfoundland and Labrador Offshore Petroleum Board (C-NLOPB), along with research completed during the Provincial Government’s internal review. The work of the Panel is now complete and its Final Report is available below. The Panel would like to thank the many individuals, groups, and organizations that provided important input to the public review process. This input has been substantial and valuable to the work of the Panel. The purpose of the Final Report (and this website) is twofold. First, it reviews the process followed by the Panel and it constitutes the Panel’s advice to the Minister with respect to hydraulic fracturing in Western Newfoundland and provides details that support this advice. 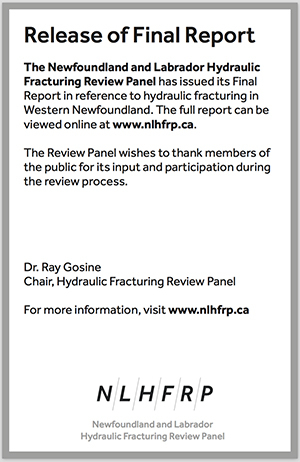 Second, the Final Report attempts to respond to information gaps that the Panel identified in its review process with respect to balanced sources of public information about hydraulic fracturing in the context of Western Newfoundland. In this respect, the Panel hopes that this report will have more general, public use beyond providing advice to the Minister. For further information, please email contact@nlhfrp.ca.